Feeling the need to take positive action to improve our world in 2017? Crafting for a cause might not immediately change the world, but making one other person feel warmer or more cared for with a handmade item is one small way we can help shape a better, kinder, and more compassionate community and country. We’ll meet on the third Sunday of each month from 10am to 2pm. Come for all or part of a session, come to any or all sessions for a project, or just work along at home. The last date listed for the session is the due date for the finished object, but if you finish early, you can drop off at Bazaar Girls any time! Some project will be free-form and you can use any kind of yarn or project. Others will have recommended yarn or patterns, and we’ll make sure to get you all that information in advance. If you don’t have time to participate, you can donate yarn or needles/hooks. We’ll also be accepting cash donations for purchasing the special yarn needed for our June/July project. If you have time, but not the resources to participate, check in with us! We’ll be collecting yarn and needles and might be able to connect you with the right materials so you can knit/crochet along! If you’re not sure you have the skills, come anyway! Experienced knitters and crocheters will be on hand to help if you get stuck! Any questions? Contact Leslie at fps.lqs@gmail.com. Project Linus. Project Linus is an organization that distributes blankets to critically ill children. We will have recommended patterns available for you to use with a yarn of your choice. There are some special requirements for these blankets, so please check with us, or read the FAQ’s on their website before you begin your project. Knitted Knockers. Create a soft, comfortable post-surgical prosthetic for breast cancer survivors. Because this project requires specific yarn and patterns, we’ll have a sign up and Bazaar Girls will be ordering the specific yarn for participants. Check out their site for requirements if you want to start on your own. Toys for children in need. 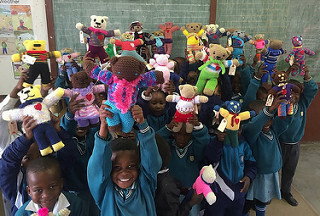 Using whatever yarn you like, make a teddy bear for orphans in Africa using the Mother Bear Project pattern or a toy of your choice to be distributed locally to a child in need. Winter Warm-up. Make hats, gloves, scarves, ear-warmers, and any other toasty item to be distributed to local service organizations.